One of my favorite things to do in Spain is a tapas crawl, and Seville, Spain, is one of the best cities for tapas. In this post, we’ll show you where to find the best tapas in Seville and what to order at each bar. Located in Andalucia in southern Spain, Seville is well known as a food-loving city; in fact, there are more than 3,000 tapas bars in Seville. The tapas tradition is so embraced that there’s even a name for it. A tapeo is a tapas crawl that will take you to various bars, where you’ll enjoy a plate of food and a drink before moving along to the next. The locals are well-versed in tapas etiquette, and if you want to fit right in at the bar, you’re going to need a little primer. We’ve put together this guide on how and where to eat tapas in Seville to get your prepared for your tapeo. 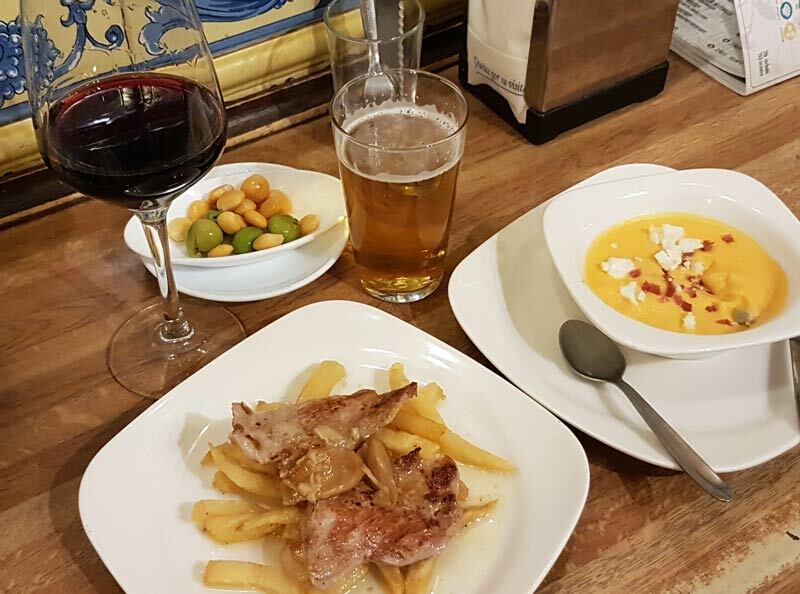 I love tapas crawling in Seville because it marries all the things I love best about traveling — cultural immersion, tasting local foods and drinking great beer and wine. Plus, it fits perfectly into your schedule as a mid-day refueling. If you’re getting ready to visit Seville, Spain, and you landed on this page, I’m sure you’re wondering what a tapas crawl is and how you can take part in it. The good news is that the tapas crawl in Seville takes place twice a day – at lunchtime and dinnertime, and all you really have to do is show up with an appetite and plunge right in. ⇒ Hungry for more? Check out our full list of Spanish foods you must try. The tapa pictured above is called Tortilla al Whisky. Seville is the only city I’ve seen that has the Whisky sauce and they’re absolutely brilliant for creating it. It’s really just a whisky butter sauce, but it’s probably one of the best things I’ve ever eaten. You’ll find it poured over various things in Seville. You can’t really nail tapas down to one thing. They aren’t like Pinchos that are served in northern Spain, which are typically just one or two bites of something on a piece of bread. Tapas are more akin to a small appetizer. They range in size from a few bites to what seems like a full plate of food. The joy of tapas is that they’re small enough that you can order 4 or 5 of them and not feel overwhelmingly full. Thus, the tapeo or tapas crawl begins. » You’ll find tapas in other parts of Spain, like Madrid, Andalucia and Granada; while you’ll find pinchos in north central Spain and pintxos in San Sebastian. Where Does the Tapeo Take Place? Seville has a rather large downtown or old town core (compared to other European cities). Tapas bars can be found literally everywhere. 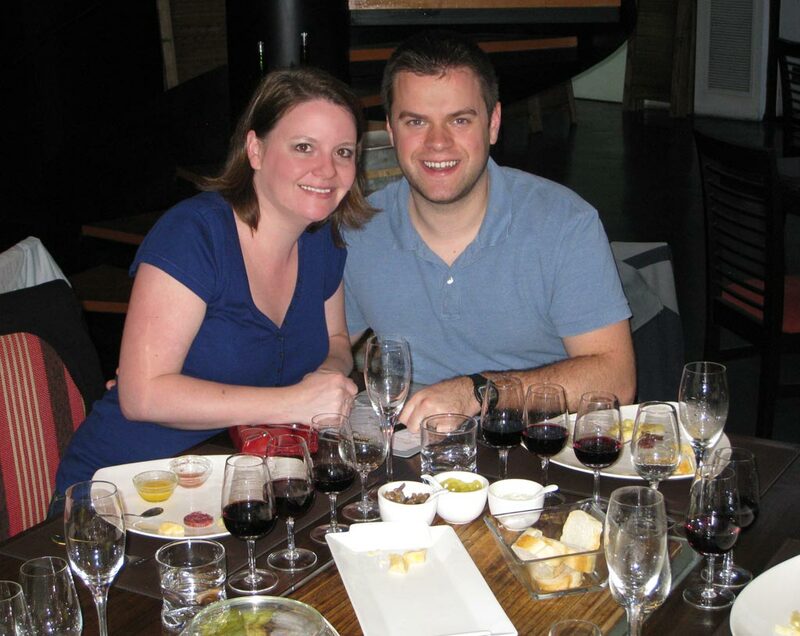 There are a few main areas where you’ll find a large concentration of tapas bars, however. These spots tend to be right around main tourist spots, like the Cathedral. When is the Tapas Crawl? The hours you can usually span from 12pm – 4pm and from 5pm – 11pm, but the hours for each bar vary. If you’re putting together a full crawl, you’ll need to check on the times to make sure you can get there next. Otherwise, you may just have to pop in wherever is open. Each bar offers something different — either their house specialty or a small list of tapas they do best. The idea is to order one or two tapas and a beer or wine (Rioja or Ribera del Duero are the two red wines to order – so good!). If you want to try more than two things, order and eat each one at a time so you don’t over do it. Nearly every bar has a menu, either a paper or book on the table, or a menu on the wall. Rarely are there pictures with any of these menus. You really don’t want to stop in the bars with pictures. That just means that it’s extra touristy. Instead, go in knowing what you want to order! Here is a breakdown of Seville tapas you want to look for on the menu and be sure to order at least once during your crawl. Each bar does these dishes a bit differently. This is one of the most iconic dishes in Seville. It’s a thin piece of pork tenderloin in whisky sauce. The whisky sauce is ahhh-mazing. You’l want to have 2 or 3 plates of this. I even ate the garlic that came with it and I never do that. If you’e ever had gazpacho, you’ve had something very similar to salmorejo. It’s a cold tomato soup, but it’s much thicker than gazpacho. It is made from tomatoes, bread, oil, garlic. Typically you’ll just get a bowl of it, but we also saw it spread on toast. In Seville, tortilla as a large chunk of egg and potato mixture that’s been baked together into something that resembles a cake. They cut a large piece for you and heat it up. This version just has that amazing whisky sauce poured over the top, because why not. One of the most typical monteditos (sandwiches) in Seville is the Montadito de Pringá. The pringá are the remains of meat that have crumbled when cooking a stew. The little bits of stewed meat are served on a crusty roll. Perfect for breakfast. Speaking of the most iconic tapa in Seville – this is it. This dish is Seville-only. You may not think that garbanzo beans and spinach could possibly taste good (at least I did ), but if you think that, this dish will blow you away. I finally gave in and tried it and it’s amazing. Fried fish is a traditional dish from the Southern coast of Spain and has been served in Seville since Roman times. It is served in many different forms all over town. Mostly it’s just one or two types of fried fish in a bucket with some sauce. You can only find this particular sandwich at Bodequita Antonio Romero. It’s called a Piripi. It has a slice of back bacon and tomato and is covered in Aioli, served on a baguette. Chorizo is one of the specialty sausages you find in Seville. It’s so packed full of flavor that to serve it on a piece of bread is perfect all by itself. It doesn’t need any other ingredients to reach perfection. 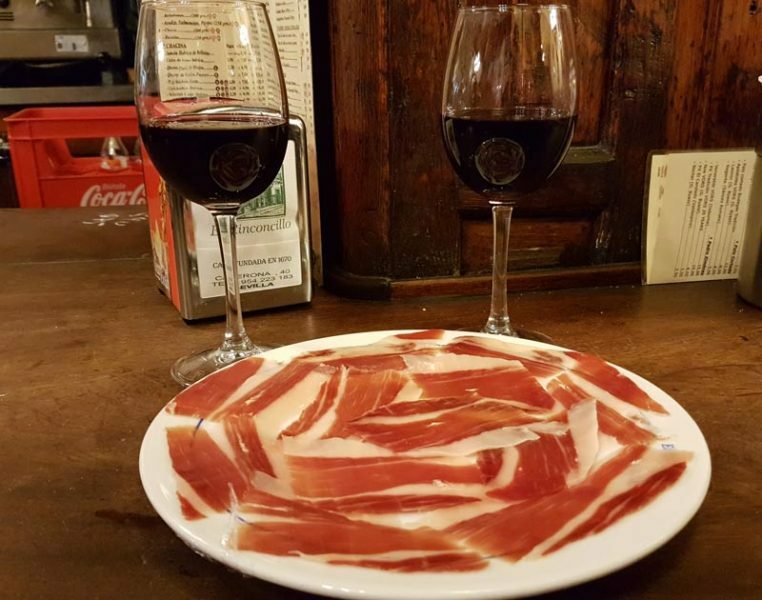 For me, there’s nothing better in Spain than a plate of premium Iberico de Bellota Jamon and some Rioja wine. You can order a plate of jamon in just about any tapas bar in Seville. A full ration (the size of the plate in the pic) is around €18. Half rations are also available. Various versions of this dish can be found on menus. This version is a stewed beef cheek, but there is also stewed pork cheek which is called Carrillada de Cerdo. It’s always served as a piece of meat on top of a bed of french fries. The meat is incredibly tender and tasty. Every day around 6pm is a time of day in Seville I especially love. It’s called la Merienda, which translates as “the snack”. It’s a time when most people will be found grabbing a gelato or a churros and chocolate with a coffee and sitting down for a little break. In Seville, you’ll find plenty of different types of Sherry tro try, since it’s produced nearby. Manzanilla is the driest of the sherries. It goes well with Manzanilla pairs perfectly with fatty foods like jamón ibérico or other cured meats because of its salty acidity. If I Don’t Speak Spanish, Will I Be Able to Order? If you don’t know much or any Spanish, you shouldn’t be worried about ordering. It’s actually quite easy to order at any bar without knowing how to say it all. Since you know the names of the dishes you want to order, thanks to our handy list of foods above, just order using the name from the list. For instance: una pringa, or una salmorejo, por favor. One [dish] and one Rioja wine, please…. Una Carrillada de Cerdo y una Rioja, por favor. Two specialties and two wines, please… Dos Pringas y dos Rioja, por favor. That is all, thank you…. Es todo, gracias. How Much Cash Do I Need? Is Tipping Expected? You’ll definitely want to have cash with you. It’s best to have small bills or coins with which to pay. A few bars do take credit cards, but it’s more common to accept cash only. Each tapa costs around €3-€5 (some more, some less) and a beer or wine costs €1-€2. We typically get to 3 or 4 bars during a tapeo and we spend around €5 per person per bar. So plan to have around €20 per person for a decent crawl. Tipping is not expected, however you can leave your extra change as a tip, if you want. For instance, if your order comes to €3.80, you could leave the 20 cents. The bars can become quite packed, especially during weekends and during the middle of peak eating hours. To avoid high traffic, plan to arrive as soon as the bars open. Some bars accept reservations for the sit down tables. If you want to actually sit – or if you have a large group that can’t just sidle up to the bar, you need to plan ahead. The tables and chairs in the main section of most bars are reserved for those eating a full meal, reservations, or large groups. If you’re doing a tapeo, plan to stand at the bar to eat. Sometimes there are counters along the back wall or standing sections in the middle of the space. Those are all fair game. Find a spot that’s open and stake it for yourself. We’ve done the Seville tapas crawl many times and each time we find new favorites, but we always head back to our favorites Seville restaurants, too. There are so many choices and so little time. Be choosy and try everything. Below are a few of what we think are the best tapas in Seville. We think the first four are absolutely must-try for tapas in Seville. The menu photo above is from La Taberna. They have dozens of tapas to choose from and all of the ones we ordered were fantastic. It’s a small place, so be prepared to find a place along the wall to stand. We ordered Salmorejo and Solomillo al Whisky here. I don’t think you can find a better Solomillo al Whisky anywhere else. Hours: 7am-4pm, 8pm-11:30pm (except Saturdays 12:30pm-4pm; 8:30-11:30). Closed Sundays. Hours: 7am-5pm, 8pm-12am, Saturday 12:30pm-5pm, Sunday closed. Before we arrived in Seville, we’d picked out Bodeguita Romero as a tapas bar we wanted to visit. We put it in our map and headed there. It wasn’t until after we walked around Seville that we realized there are actually quite a few different Romeros. Bodeguita Antonio Romera is the original. But there is also a Bodeguita Romero and a Ristorante Tapas Romero nearby. If you want to try the Piripi, make sure you go to the Antonio Ramero. They also have a Pringa montedito that everyone loves. The tables outside are reserved for those ordering a full meal. If you only want tapas, you’ll need to go in to the bar. Hours: 12pm-5pm, 8pm-12am, Sunday 1pm-5pm, Monday closed. Located down a back street, Las Teresas has a small L-shaped bar and quite a bit of outdoor seating. If you can find your way in at the bar, there are many things to choose from. You can tell from the Jamon hanging from the ceiling that they specialize in Jamon Iberico. We thought it was very good here. If you look around at the notes posted up around the bar, you’ll find the specialties they have that day. Sometimes that include cod cheeks, special rice dishes, fried bits of this and that. Order whatever sounds good. We had the octopus salad and thought it was great. This is the only bar on our list that isn’t located in the centro. It’s just on the cusp of centro in the El Arenal neighborhood. It’s the oldest bar in Sevilla. Of course that makes it quite touristy – everyone wants to go there, but there are also quite a few locals. Believe me when I say this place is always packed. But if you go in the middle of the day – after lunch rush, before dinner rush – you’ll be able to find a spot around a barrel. This is the place to go for churros and chocolate in the afternoon. Try to get there right at 6pm, and just wait around until a spot opens up at the bar. We recommend only ordering one batch of churros for 2 people as it’s a pretty large order. Churros are always ordered with Cafe Con Leche. Hours: 7:30am-9pm, Saturday 8am-9pm, Sunday Closed. Vermut is a apertivo that is often drank before lunch or dinner in Spain as a pre-meal drink. You can find it all over Seville, but if you want to try a few different ones and learn a little bit about them, this is the place to go. The atmosphere is cozy and inviting. The owner knows a lot about vermut and can help you decide what to try. They don’t serve tapas, but do have a few snacks you can have with your drink. This tiny slice of a bar has some great tapas, but their specialty is orange wine. 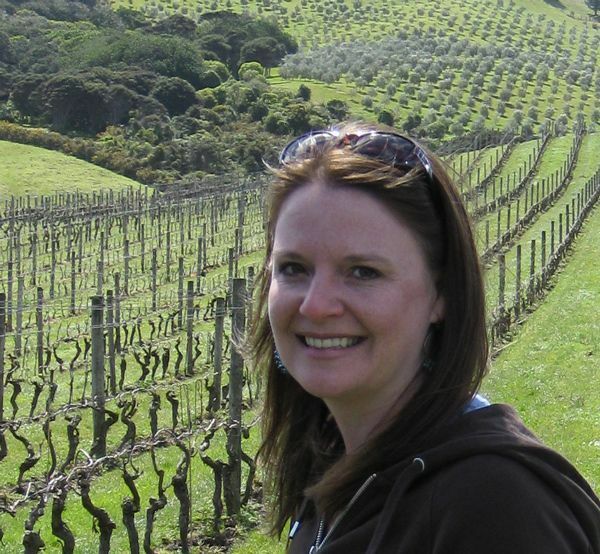 There’s usually a pretty long line at this place, because everyone knows it’s the place to go for orange wine. In case you’re thinking it’s like Georgian orange wine, I’ll stop you right there. Seville’s orange wine is made with an Oloroso sherry base. These grapes are mixed with alcohol, then aged in the American oak barrels for between five and seven years, then macerated with orange peels. If you’re looking for a hotel for your stay in Seville, we can recommend the affordable luxury El Rey Moro Hotel Boutique and Boutique Hotel Casa del Poeta for a hotel with a lot of Sevilla design and charm. Both are located right in the center of the action, which will cut down on walking distances. No matter what you have to eat, the tapas crawl in Sevilla will be one of the best parts of your trip to this area. We could have spent the entire time there devouring tapas. It’s a good thing they close in the afternoon or we’d just keep eating. Have you been on a tapas crawl in Seville? Tell us about it in the comments. We want to hear what you loved about it the most.